Jana Morgan is associate professor of political science at the University of Tennessee and is currently a Visiting Scholar at the Russell Sage Foundation. Her research explores how patterns of economic, social, and political marginalization undermine democratic institutions and outcomes. She is the recipient of the Latin American Studies Association’s Van Cott Award for Bankrupt Representation and Party System Collapse (Penn State, 2011), which demonstrates how party systems’ failure to provide adequate linkages between society and the state precipitate their collapse. Her research on parties, representation, and exclusion has also appeared in American Political Science Review, Comparative Political Studies, Journal of Politics, and Latin American Politics and Society, among others. Early advocates of decentralization lauded it as a strategy for strengthening democratic institutions, but later scholarship has emphasized decentralization’s negative consequences, especially for political parties. This article argues that the impact of political decentralization on established parties is shaped by the context in which the reforms occur, with poor economic performance and limited programmatic differentiation making parties more vulnerable to the challenges posed by decentralization. The article explores how decentralization under such circumstances has contributed to party decay in Latin America, where declining support for established parties has been significant, in some places undermining democratic stability and governability. The article employs cross-national time-series analysis and case studies. The quantitative evidence indicates that political decentralization weakens existing parties in contexts of poor economic conditions and little ideological differentiation in the party system. Case studies elaborate the processes through which decentralizing reforms together with economic conditions and party linkages affect party systems. Estudios tempranos sobre la descentralización celebran el efecto positivo de dichos procesos sobre las instituciones democráticas. En contraste, estudios más recientes enfatizan las consecuencias negativas de la descentralización, especialmente para los partidos políticos. Este artículo argumenta que el impacto de procesos de descentralización sobre los partidos políticos depende del contexto en que dichas reformas ocurren. Específicamente, contextos de pobre desempeño económico y falta de diferenciación programática hacen a los partidos más vulnerables a los desafíos planteados por la descentralización. El artículo explora como, en dichas circunstancias, la descentralización ha contribuido al deterioro de los partidos políticos latinoamericanos, en algunos casos debilitando la estabilidad democrática y gobernabilidad. El artículo incluye un análisis estadístico y de casos. El primero muestra como la descentralización debilita los partidos existentes en contextos de pobre desempeño económico y falta de diferenciación ideológica en el sistema de partidos. El segundo ilumina los procesos mediante los cuales las reformas de descentralización, junto con condiciones económicas y mecanismos de vinculación partidaria, afectan al sistema de partidos políticos. Political decentralization through the establishment of separate subnational elections was commonly, but not uniformly, implemented in Latin America and elsewhere during the 1980s and 1990s. International actors like the World Bank as well as intellectuals and reformers advocated strengthening subnational governments and decentralizing elections (Nickson 2011). These reforms were endorsed as a strategy for promoting efficiency, accountability, and transparency (e.g., Dillinger 1994). As a result, politicians seeking to improve governance or please lenders often turned to decentralization (Kornblith 1998; O’Neill 2005). Early scholarship exploring the impact of these reforms emphasized their positive results (Grindle 2000, 38). Some even equated political decentralization with democratization, contending that local elections are pivotal for deepening democracy (Fox 1994). Evidence suggests that decentralization may enhance democratization through mechanisms such as fostering policy innovation, opening doors to new actors, and promoting citizen engagement (Goldfrank 2011). However, this initial wave of scholarship often overlooked decentralization’s potential costs, particularly for political parties,1 and recent research has shifted focus to the detrimental consequences of decentralization. This scholarship suggests decentralized institutions may exacerbate corruption and clientelism (Ryan 2004), permit subnational authoritarian enclaves (Giraudy 2015), and promote parochialism (Harbers 2010; Sabatini 2003). Most importantly for this article, some have suggested that decentralization destabilizes parties by encouraging fragmentation, creating resource challenges, and imposing organizational inefficiencies (Brancati 2008; Ryan 2004; Sabatini 2003). This article goes beyond the debate over decentralization as a boon or threat to democracy and instead explores how the environment in which reforms are implemented influences their consequences for democratic institutions, particularly parties. Rather than specifying uniform outcomes of decentralization, the article illuminates the way that context conditions the reforms’ impact. I identify two contextual features likely to shape how the creation of subnational elections affects parties: economic conditions and party linkage strategies. Political decentralization imposes new challenges and resource demands on established parties unaccustomed to subnational competition by heightening threats from emerging competitors and intensifying organizational pressures (Brancati 2008; Harbers 2010, 5–7). If the economy flounders as parties face these challenges, the resource constraints and poor performance evaluations stemming from economic crisis are likely to intensify the costs decentralization imposes for the system’s existing parties. Alternatively, when economic conditions are favorable, parties are better equipped to manage decentralization. Linkage strategies may also condition how political decentralization affects parties. In systems that offer clear policy options, parties often emphasize ideological or policy-based appeals that are not heavily resource dependent and may be more readily reproduced across competitive domains. Without meaningful ideological differentiation, parties are more likely to rely on clientelism, which is resource-contingent and may require repeated exchanges. Thus, in systems without meaningful policy alternatives, existing centralized parties will be susceptible to the pressures imposed by new subnational elections. Using cross-national time-series analysis and cases studies, this article provides evidence that political decentralization undermines across-the-board support for existing parties if they face poor economic conditions or do not furnish meaningful programmatic options. These findings indicate that while decentralization may enhance representation and participation in some contexts, in others the reforms weaken established parties, which are often channels for attaining these very goals. The article offers insight into the problem of declining support for major parties across entire party systems by assessing the role decentralization plays in this process.2 Moreover, while some research has suggested decentralization’s effects may be context-contingent, this is the first study that specifies precise contextual factors that shape the influence of reforms and conducts cross-national analysis to test these conditional relationships and delineate the mechanisms through which they operate. Understanding the potential connection between political decentralization and system-level party decay is particularly important given the challenges facing many parties in recent decades. Parties across Latin America and around the world have increasingly encountered low legitimacy, and some long-standing organizations have virtually disappeared. This article is thus interested in exploring how decentralization might contribute to systemic party decay, in which major parties together erode.3 This definition of decay incorporates a variety of experiences that all manifest the basic pattern of declining support for major parties, but it is agnostic as to the precise rate of decline or its long-term trajectory. The concept therefore spans a variety of specific outcomes including secular decline, collapse, and even decay followed by eventual recovery. By allowing for the possibility that party decay follows different courses in different contexts, this approach captures the essential elements of the shared experience across various party systems that have seen established parties lose their footing in recent decades. Party decay produces volatility, threatens governability, and weakens accountability even in long-standing democracies, and such consequences are especially pronounced in newer democracies where party instability and representational shortcomings may undermine democracy (Mainwaring and Scully 1995). Unfortunately, party decay is most common where it carries the greatest risk. In Latin America, declining support for established parties has been a recurrent threat to democratic stability. The substantive significance of understanding party decay in such contexts motivates the empirical focus on Latin America. This focus also offers analytical leverage, as the region manifests considerable variation in party stability. Party decay has plagued various Latin American countries from long-standing democracies with institutionalized party systems like Venezuela to fragile democracies with weak parties like Ecuador, while other countries have featured greater party system continuity. Latin America also manifests important variation on key explanatory variables—decentralization, economic conditions, and linkage strategies. Political decentralization, which I define as the establishment of direct elections for subnational executives or legislatures, presents resource and organizational challenges for parties unaccustomed to subnational competition.4 Parties well-adapted to existing subnational elections may effectively employ strategies that take advantage of the federal structure, devolving resources or power to subnational governments in order to bolster decentralized networks and protect themselves from other threats (Corrales 2002; Gibson and Suarez-Cao 2010; Garman, Haggard, and Willis 2001; Harbers 2014). However, parties unaccustomed to subnational competition often encounter significant challenges from new decentralized elections. Regarding resources, political decentralization requires that parties fulfill a range of additional, costly tasks in order to compete subnationally, such as identifying, recruiting, and selecting scores of candidates and running numerous subnational campaigns. Subnational elections also require parties to adapt campaign messages across hundreds or thousands of subnational contexts with diverse constituencies (Harbers 2010, 7; Luna 2014). At the same time, political decentralization lowers barriers to entry, inviting new challengers (Hug 2001). In Colombia during the decade after political decentralization, party lists competing for the chamber of deputies more than doubled, and independents won one-third of the governorships (Dargent and Muñoz 2011, 54). Elsewhere, new parties representing marginalized ethnic or regional interests have flourished following decentralization (Birnir 2004; Van Cott 2005). Thus while new parties stand to gain in subnational realms of competition, existing parties encounter more competition even as their effectiveness declines amid resource pressures and organizational discontinuity (Brancati 2008; Harbers 2010; Ryan 2004, 88). Given the challenges decentralization poses for existing parties, introducing subnational elections may contribute to party decay across the system. Established parties with national presence are likely to find the demands of decentralization especially challenging. These parties need to generate sufficient resources to continue competing in national elections while adapting to the new contours of subnational politics, whereas their competitors may be satisfied to prioritize regionally circumscribed contests. Also, established parties operating in contexts without subnational elections are likely to have organizational structures designed to maximize competitiveness in national contests. Competing in local or regional elections requires more adaptive effort for these parties than for new entrants or smaller regional competitors that are more organizationally suited for subnational competition. However, the risks from decentralization are only part of the equation, as the conditions in which parties operate may shape their capacity to respond to these pressures. I theorize that economic context and the profile of party system linkage strategies shape the extent to which pressures from decentralization translate into systemic party decay. When the economy is performing well and resources are abundant, existing parties are better equipped to handle challenges from new subnational elections. During good times, parties are able to fund subnational contests, identify strong candidates, run contextualized campaigns, and mobilize voters without sacrificing national performance. But when resources are limited, they lack capacity to mount numerous campaigns and flounder in the face of surging challengers (Benton 2005; Morgan 2011). Although parties may finance their activities from a variety of public and private sources, most (if not all) of these funds are likely undercut by economic downturns, meaning all parties have fewer resources available under poor as opposed to prosperous conditions.6 Established parties are particularly vulnerable to the constraints imposed by changes in resources, because the funds required to compete nationally are significantly greater than those needed by emerging, subnationally focused competitors. Moreover, while favorable economic evaluations offer a reservoir of support for incumbent parties (Singer 2013), poor performance makes parties especially vulnerable. Previous research has found evidence of a similar relationship in which the economy interacts with political institutions to shape support for existing parties (e.g., Benton 2005). Here I expect an analogous interaction between economic conditions and decentralization-induced institutional change, with resource limitations and political decentralization combining to undermine established parties across the system. Challenges due to decentralization may also be more pronounced in party systems that lack meaningful programmatic options. Without much ideological differentiation, parties are more likely to rely on clientelism, making them particularly susceptible to the resource and organizational challenges posed by decentralization.7 When decentralization multiplies electoral contests, clientelist linkage requires parties to unearth enough material benefits to contest not just occasional national elections, but also numerous subnational ones (Gutiérrez Sanín 2007, 275ff; Luna 2008). In effect, clientelism magnifies the resource pressures from decentralization, and clientelist systems are especially vulnerable to resource shortages. Alternatively, systems with programmatic structuration are less susceptible to the resource challenges of decentralization because ideological differentiation allows parties to employ less resource-intensive, programmatic appeals, which more readily transfer from the national to subnational level. Organizational pressures from political decentralization may also be more hazardous in systems without meaningful ideological differentiation. In centralized clientelist systems, local politicians rely on the national party for patronage, and national leaders depend on subnational affiliates to deliver votes. This interdependence is essential for clientelist effectiveness. However, decentralization often decouples local and national politics, disintegrating these mutually reinforcing ties (Harbers 2010; Ryan 2004; Sabatini 2003). With decentralization, parties lose control of subnational agents who rely less on the party, and individual clientelist networks proliferate, weakening parties’ clientelist capacity and efficiency (Dargent and Muñoz 2011; Ryan 2004, 88; Sabatini 2003, 149). In light of the organizational and resource vulnerabilities associated with nonprogrammatic linkage, systems without meaningful programmatic options are more likely to experience party decay after decentralization. The chief goal of the subsequent analysis is to assess how and when political decentralization leads to systemic decays in support for major parties. A contrasting view within the literature has posited that party decline prompts leaders to decentralize in order to retain some power at the subnational level (e.g., O’Neill 2005). Much of this argument is not exclusively concerned with political decentralization but emphasizes fiscal decentralization, a process that is likely subject to distinct dynamics. Nevertheless, I consider the possibility of reverse causation by assessing case-based evidence and previous research about the motivations for establishing subnational elections here, and by testing this possibility empirically below. Evidence regarding the motivations and processes for establishing new subnational elections suggests that governing parties’ desire to prevent ongoing decay was not the major impetus for political decentralization in most cases. In fact, leaders of established parties often resisted efforts to institute subnational elections. Advocates for the parties frequently lamented the damage that political decentralization could cause their organizations, acquiescing to reform only in the face of considerable pressure (de la Cruz 2004; Lalander 2004, 140–142; Penfold-Becerra 1999). Instead, political decentralization was often driven by domestic reformers with weak or nonexistent partisan ties or by politicians outside the governing parties who sometimes collaborated with international organizations (Grindle 2000, 54–57; Mayorga 2005, 168; Nickson 2011, 5). Reformers frequently operated through the executive, where the power of traditional parties was more circumscribed, and enjoyed support from presidents who maintained weak or conflictual relationships with parties (Corrales 2002). Even scholars who stress the role of strategic considerations in understanding the timing and scope of decentralization emphasize the reforms’ origins outside the party elite (O’Neill 2005; 108, 118–119, 184) and identify calculations aside from immediate electoral consequences (Eaton 2004, 220). In Colombia, for example, the reform process bypassed party elites and aimed to weaken major parties. Traditional party leaders were circumvented through a constitutional convention controlled by reformers who deliberately pursued changes aimed at opening up competition, devolving power away from parties and limiting party access to patronage (Dargent and Muñoz 2011, 52; Gutiérrez Sanín 2007, 255–260). In Venezuela, political decentralization was introduced by technocrats and reformers through a presidential commission, found its champion in a president who maintained a highly conflictual relationship with his party (Corrales 2002; Lalander 2004, 135–142), and was enacted despite protestations from traditional party power brokers (O’Neill 2005, 184–187; Penfold-Becerra 1999). In Chile, establishing municipal elections was part of an effort to redemocratize following the transition. Wresting power from subnational authoritarian enclaves and appeasing advocates for the old regime motivated the reform (Bland 2004; Eaton 2004, 232–233). Thus, while strategic concerns were not insignificant, the motivations for political decentralization were not simply ruling parties’ electoral calculations but instead centered on factors like strengthening subnational democracy and undermining parties. Additionally, to preview the analysis below, the assertion that party decay causes decentralization does not find support in quantitative evidence that covers all of Latin America and thus offers a more comprehensive test than previous research focused on a few cases (e.g., O’Neill 2005). Instead, the analysis to which I now turn suggests that decentralization contributes to party decline. To assess how political decentralization shapes party performance, I analyze changes in electoral support for major parties in seventeen Latin American countries.8 For each country, I include all democratically elected legislatures from 1975 through the first decade of the 2000s.9 Analyzing national-level party performance permits measurement of changes in parties’ electoral support before and after subnational elections are established. Subnational analysis is not suitable because measuring support for parties in subnational elections before political decentralization is not feasible—by definition, subnational elections were not held before the reforms. I measure change in party support as the difference in legislative seat shares held by major parties from the previous to current term.10 The theory focuses on assessing the extent to which decentralization invites new competitors and poses a challenge to all parties with a stake in the status quo, rather than offering an account of ordinary changes in existing parties’ relative performance. Reflecting this logic, the dependent variable captures the joint change in seat shares for all major parties, measured by subtracting the seat share held by major parties in the previous legislative term from the same parties’ share in the current term.11 Positive scores indicate gains for major parties; negative scores indicate losses. Operationalizing decay across the system also accomplishes the practical empirical goal of stripping out variations due to ordinary fluctuations that routinely occur between government and opposition and focusing on shifts toward outsiders. Differencing captures the underlying concept of continuity, growth, or decay in support—the outcomes this article sets out to explain. To measure political decentralization, I use the World Bank’s Database of Political Institutions (DPI) (Beck et al. 2001). DPI reports the existence of local and regional elections annually, data I use to construct a political decentralization index that ranges from zero to four, where zero indicates no subnational elections and four means local and regional assemblies and executives are all directly elected.12 I calculate the cumulative difference in the index and multiply by a ten-year smooth-compact decay function.13 This approach reflects an expectation that the impact of changes in decentralization will be strongest in the first election after implementation and then decline over ten years.14 To illustrate, if a country implements new elections for local mayors and councils, the score on the decentralization measure would shift from zero to two for the first election held after decentralization and then decline, gradually at first and then more quickly, until reaching zero ten years later. Lack of changes in decentralization yields a steady score of zero. The measurement strategy reflects two important facets of the hypothesized causal process. First, it mirrors the expectation that the creation of subnational elections threatens existing parties, not the mere existence of subnational contests. Second, it captures the intuition that while challenges from political decentralization are strongest immediately, they may continue threatening existing parties over several years until they either adapt or decay. Because I have hypothesized that decentralization will be more harmful to existing parties under poor economic conditions, I interact decentralization with economic growth. Growth captures the economic features most relevant for exacerbating or mitigating the effects of decentralization on major party support. Prosperity cushions the blow imposed by decentralization, enables parties to access tangible resources to sustain their organizations, and offers a reservoir of goodwill that governing parties earn by delivering successful economic performance. In contrast, economic stagnation/contraction impedes parties’ adaptive capacity, making them vulnerable to decentralization. 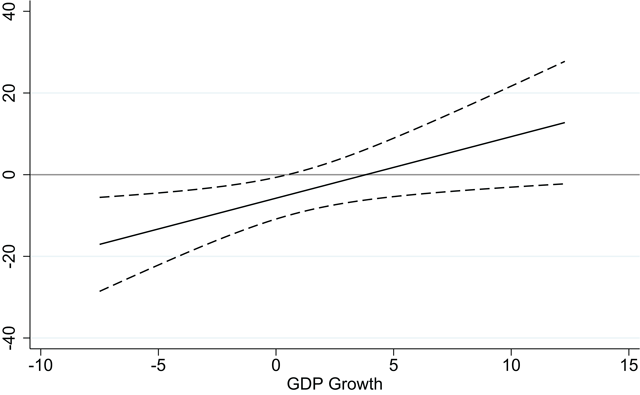 Thus growth operationalizes the underlying idea that prosperity facilitates party adaptation, while a contracting economy limits parties’ latitude, amplifying the costs of decentralization.15 Additionally, in line with the economic voting literature and other studies of party decay or collapse, a weak economy may also undermine support for major parties directly (Dietz and Myers 2007; Hug 2001). To consider how a party system’s programmatic structuration conditions the effect of decentralization, I interact decentralization with a system-level measure of ideological differentiation between parties. To measure differentiation, I follow a methodology developed in the literature on party system structuration, which uses a single indicator across the party system and captures the standard deviation of parties’ ideologies weighted according to their size in the legislature (see Alvarez and Nagler 2004; Dalton 2008).16 Following Singer (2016), I employ data from the Parliamentary Elites in Latin America (PELA) project to calculate this measure for Latin American party systems, although I diverge slightly from Singer in calculating party ideology using the self-placement of legislators from that party (as opposed to legislators’ placement of their party).17 Greater differentiation signifies a more defined programmatic space, while less differentiation indicates more overlap between parties and fewer programmatic options for voters.18 When programmatic differentiation is limited, I expect parties to be more susceptible to challenges from decentralization, while more ideological structuration should limit decentralization’s harm. Additionally, previous scholarship has argued that when the policy positions of major parties are not distinguishable, support for established parties is likely to decay (Morgan 2011). Thus, I anticipate a positive relationship between programmatic differentiation and maintenance of major party support. The quantitative analysis also controls for several institutional features that may influence party decay/persistence: party system institutionalization, electoral system proportionality, and number of parties. Institutionalization, in which existing parties maintain long-standing ties to society, is likely to promote electoral continuity (Mainwaring and Scully 1995). Following a frequent strategy in the literature (e.g., Tavits 2005), I operationalize institutionalization as average age of parties in the system. Proportional electoral systems reduce costs of entry, exposing parties to more competition and enabling decay (Birch 2003). Proportionality is a binary variable coded one if the lower house is elected using proportional representation.19 Number of parties is measured as lagged effective number of parties (ENP). Finally, I control for the number of years since the founding democratic election because party system features may change as democracy solidifies. Table 1 displays results from analysis examining the relationship between decentralization and changes in major party support. It begins by considering decentralization alone and then assesses how economic growth and ideological differentiation condition decentralization’s effect. Each model includes only one decentralization interaction to ease interpretation and minimize potential collinearity in models containing multiple interactions with the same variable. In the first model without interactions, decentralization has a negative but insignificant coefficient. When models 2 and 3 consider the conditioning effects of growth and ideological differentiation, statistically significant effects for decentralization emerge. To assess precisely how the impact of decentralization varies across all observed values of these interacting variables, I calculate marginal effects and standard errors. Political Decentralization and Change in Major Party Support. Models are estimated with fixed effects and clustered standard errors to capture unit-specific effects. All interactions constructed using mean-centered versions of variables. Figure 1 displays the effect of decentralization conditioned on growth, demonstrating that decentralization is most damaging when economic conditions are poor. If growth is negative, decentralization has a statistically significant negative effect on major party support, and as growth declines the damage from decentralization increases. When growth stagnates at or below zero (as it did in 15 percent of the country-years in the sample), major parties faced with new subnational elections experience decay, and when growth reaches its minimum, seat shares decline by nearly twenty points following establishment of just one new kind of subnational election. These findings support the hypothesis that poor economic conditions limit parties’ capacity to respond to resource strains created by new subnational elections. Effect of Decentralization conditioned on Economic Growth. Source: Author’s calculations based on model 2 in Table 1. Note: Depicts effect of decentralization across observed (uncentered) values of GDP growth. To explore further the ways in which resource constraints exacerbate political decentralization’s deleterious effects, I also considered how fiscal decentralization might strip centralized parties of resources and undermine their capacity to sustain support. Fiscal decentralization apportions larger shares of resources to subnational governments and, as a result, may reduce centralized party organizations’ ability to allocate and control public funds. The theory articulated here does not expect fiscal decentralization alone to weaken established parties—in fact, parties accustomed to managing decentralized political contexts may effectively employ decentralization resources to shore up vital subnational elements of their organization (Corrales 2002; Harbers 2014; Garman, Haggard, and Willis 2001). However, parties unfamiliar with subnational political competition may be ill prepared to exploit decentralized resources (Harbers 2010). In these contexts, devolution of public funds may strip parties of resources, limiting their ability to adapt to political decentralization in much the same way a weak economy might. The analysis in the text also suggests decentralization’s effect is conditioned by the extent to which the party system offers meaningful programmatic options. 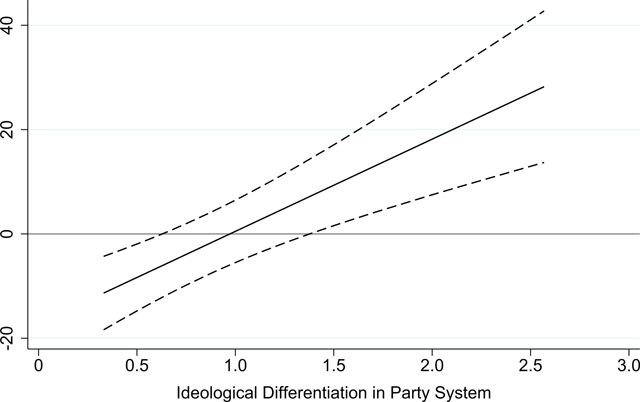 Figure 2 displays the marginal coefficients for decentralization across observed values of party system ideological differentiation. The results show party systems without much differentiation are more susceptible to the organizational and financial difficulties posed by decentralization, while systems with greater programmatic structure are more resilient. Decentralization has a statistically significant negative relationship with party support when ideological differentiation falls below 0.7, which indicates limited programmatic alternatives and accounts for one-third of the sample. Alternatively, when polarization surpasses 1.35—as it does in 14 percent of country-years—decentralization is associated with increased party support, suggesting that highly programmatic systems benefit from decentralization. Effect of Decentralization conditioned on Differentiation. Source: Author’s calculations based on model 3 in Table 1. Note: Depicts effect of decentralization across observed (uncentered) values of ideological differentiation. Returning to the analysis in the text, I also consider how ideological differentiation and the economy influence party support beyond their role conditioning decentralization’s effect. I expect each to be positively associated with aggregate support for existing parties. Because they are components of interaction terms, I calculate their coefficients conditional on decentralization. More detailed case-based analysis illuminates the mechanisms through which decentralization undermines existing parties, clarifies causal ordering, and emphasizes the importance of the economic and party system context for understanding the effects of decentralization. I begin with a detailed analysis of Venezuela, a country in which political decentralization occurred amid poor economic performance and limited ideological differentiation, contributing to significant decay of all the major parties in the system. Drawing on sixteen months of field research and eighty-nine author interviews with party leaders, reformers, and other elites as well as news accounts, government documents, and secondary sources, this analysis offers insights into the causal process reflected in the quantitative analysis above and highlights how resource constraints and reliance on clientelism interact with political decentralization to undermine established parties.24 Then I discuss the Bolivian case. Bolivia exhibited generally improving economic performance but declining ideological differentiation in the years following the establishment of new levels of subnational elections, which contributed to weakening the traditional parties and allowed the emergence of new actors better adapted to the decentralized context. Analysis of Bolivia emphasizes how party system context conditions the effects of political decentralization. Finally, I outline party system outcomes in Chile, where new local elections established in 1992 emerged as part of the democratization process in a context of prosperity and programmatically differentiated parties. This case highlights how establishing subnational elections does not automatically translate into party decay; rather it is the combination of decentralization with poor economic performance or lack of policy differentiation that weakens system parties. As the economy deteriorated in the 1990s, resource shortages combined with these pressures to undermine major party support. Oil prices stagnated, nonpetroleum revenues dropped, and per capita public spending declined by half between 1989 and 1996 (Fernández 2003). The parties made drastic cuts, rationing campaign funds, shuttering offices, and suspending some utility services.30 The economic situation was particularly abysmal during the national elections of 1993 and 1998, when growth barely surpassed one-quarter percent (World Bank 2012). In this context, the parties confronted significant resource pressures associated with identifying candidates and mounting campaigns for new subnational elections, often leaving candidates without access to party resources. The traditional parties lost significant ground in the legislature and suffered a major defeat when Hugo Chávez won the presidency in 1998. When the challenges of decentralization were met with significant resource constraints, the parties decayed. Limited programmatic differentiation also heightened the threat from decentralization. Over the 1990s, the established parties converged ideologically, collaborated in policy making, and even joined as electoral and legislative allies, removing any semblance of programmatic structuration from the system (Morgan 2011; Seawright 2012). The parties increasingly turned to clientelism, but decentralization posed particular challenges for this strategy, weakening the central parties’ clientelist monopoly by limiting party control over patronage and disrupting clientelist networks.31 Decentralization undermined clientelist interdependence—networks that had previously channeled benefits designed to yield support for the entire party now primarily served individual subnational politicians (Grindle 2000, 82–84; McCoy and Smith 1995).32 Without the ability to offer distinguishable programmatic options, the parties relied increasingly on clientelist networks they no longer controlled, undermining the utility of clientelism for yielding support in national-level contests. Although decentralization was certainly not the only factor that contributed to Venezuelan party-system decline, the reforms weakened the traditional parties, which surrendered their dominant positions and now form part of the diverse anti-chavista coalition. Conversely, new parties, including pro- and anti-Chavez organizations that emerged in the context of decentralization, have solidified significant gains (Morgan 2018). The Venezuelan experience highlights the mechanisms through which decentralization threatens parties, specifying how the reforms’ resource and organizational demands contributed to system-wide party decay, and emphasizes how economic crisis and limited ideological differentiation left the parties with few tools to respond to these demands. Moreover, while a poor economy and lack of ideological differentiation each exacerbates the costs of decentralization, the Venezuelan case also suggests that establishing new subnational elections may be particularly risky when parties lack ideological differentiation and encounter significant resource constraints at the same time. As the Venezuelan parties relied increasingly on clientelism, the resource pressures associated with decentralization were especially acute because more elections generated greater demand and disarticulated clientelist networks undermined inefficiency. Yet the constricting economy meant parties had little capacity to respond. This combination appears to have been quite pernicious. To assess this possibility beyond Venezuela, I conducted additional quantitative analysis modeling a three-way interaction between decentralization, economic growth, and ideological differentiation. This analysis uncovers a statistically significant interaction indicating that the negative effect of decentralization is most pronounced where both poor economic conditions and little ideological differentiation exist.33 Thus, the compounding of costs that we observe in Venezuela appears to reflect a broader pattern: the challenges of decentralization are multiplied in party systems that are both resource-constrained and nonprogrammatic. The Bolivian case emphasizes how party linkage strategies shape the effects of political decentralization even when economic performance is strong. Bolivia has undergone several bouts of decentralization since its 1982 democratic transition. Focusing on political decentralization, a new municipal code established direct elections for mayors and councils in existing municipalities, first held in 1987. Subsequently, the 1994 Law of Popular Participation (LPP) intensified the process of municipalization, creating new local governments where none had previously existed (Grindle 2000, 140–141). More recently, Bolivia implemented departmental elections for prefect (governor) in 2005 (Vergara 2011). Political decentralization had significant implications for Bolivian parties. Resource demands proliferated as parties faced a variety of costs related to new tasks such as identifying suitable candidates and funding local campaigns (Mayorga 2005; Van Cott 2005). Simultaneously, decentralization ended the resource monopoly enjoyed by national parties, which faced escalating subnational claims on previously centralized funds as local candidates solicited money for their campaigns and local officials controlled newly devolved resources (Barr 2005; Gray-Molina 2001). Moreover, national-level policy debates had limited relevance in subnational campaigns. Therefore, the parties expended considerable effort developing contextually appropriate subnational strategies to compete across a diverse array of municipalities (Mayorga 2005). The parties also faced new competitors at the subnational level, as community leaders, social movements, and indigenous communities launched candidacies (Gray-Molina 2001; Sabatini 2003; Van Cott 2005). Combating locally based competitors and developing contextualized campaigns proved especially difficult for traditional parties, as they possessed national organizations accustomed to operating with limited local presence (Mayorga 2005). In contrast, parties that emerged following the initial wave of decentralization were better adapted to subnational competition and have used the most recent round of decentralization to their advantage and made further gains, while the traditional parties have continued to decay (Vergara 2011). At the time subnational elections were introduced in the late 1980s, Bolivia was enjoying an economic recovery after disastrous bouts of hyperinflation earlier in the decade, and GDP growth remained at or above 2.5 percent in all but one of the ten years following the initial 1987 municipal elections. Thus economic conditions did not complicate the parties’ adaptive challenge in the years after decentralization. Moreover, at the time of the 1989 legislative elections, the first following establishment of subnational contests, the traditional parties retained some ideological differentiation. President Víctor Paz Estenssoro (1985–1989) of the Movimiento Nacionalista Revolucionario (MNR) had allied with former right-wing dictator Hugo Banzer’s Acción Democrática Nacionalista (ADN) to enact an austere stabilization program, contradicting MNR’s legacy and eroding ideological differences between the two parties (Conaghan and Malloy 1994). However, during the election the traditional left party Movimiento de la Izquierda Revolucionaria (MIR) offered a viable alternative to the neoliberal status quo. As a result, support for MIR grew in the late 1980s, and the three major parties together maintained control of over 80 percent of legislative seats in 1989. However, following the elections, MIR’s presidential candidate Jaime Paz Zamora entered into a pact with his ideological adversary, the rightist ADN, which allowed him to ascend to the presidency,34 and committed MIR to the neoliberal consensus (Mayorga 2005). Thus by the time Bolivians elected a new congress and president in 1993, no matter which party they voted for, they received the same basic policy prescriptions (Conaghan and Malloy 1994). Ideological differentiation had disappeared, and the traditional parties became increasingly reliant on clientelism (Barr 2005; Mayorga 2005). But with decentralization, the parties found it difficult to generate the clientelist exchanges needed to compete in numerous local races (Gray-Molina 2001). Moreover, the hierarchical parties were ill equipped to maintain access to localized resources as decentralization undermined their control over local clientelist networks, as (Barr 2005; Mayorga 2005). The parties’ leverage over aspiring politicians dwindled, and local officials redirected subnational resources to advance their personal goals (Gray-Molina 2001). In this context, decentralization’s negative consequences began to emerge, and the three traditional parties lost 11 percent of their legislative seat shares in the 1993 elections. Thus party decay did not occur immediately following decentralization, at a time when the economy was performing well and some programmatic options remained within the system. Instead, decay developed within the first decade after reform, as ideological differentiation evaporated and clientelism became the dominant strategy.35 Also note that decay here was not as steep as in Venezuela, where neither resources nor ideological differentiation was present. Moving forward to 2005, Bolivia implemented elections at the intermediate level of government for departmental prefects/governors. With this second round of political decentralization, the remnants of the traditional parties were exclusively clientelist. These parties, which had not adapted to decentralized competition, fared quite poorly in both national and departmental-level elections in 2005, losing the presidency and winning only three of nine of departmental prefectures and 33 percent of seats in the Chamber of Deputies. New parties and social movements were better poised to capture local patronage and compete in subnational elections (Grindle 2000; Mayorga 2005). In particular, the indigenous party Movimiento al Socialismo (MAS), which developed in a post-decentralization context, was organizationally well adapted to subnational competition and blossomed (Van Cott 2005). In 2005, as political decentralization intensified, MAS consolidated a central position in the party system, winning 55 percent of lower house seats and propelling Evo Morales into the presidency (Vergara 2011). The party’s adaptive capacity in the face of further political decentralization stems both from its clear ideological program, which facilitated national appeals that transcended local clientelist demands, and from its status as a post-decentralization party, formed partly as a result of decentralization and with an organization better suited to subnational competition. Thus, while the traditional parties continued to suffer in the face of repeated waves of decentralization, MAS used decentralization to its advantage. Overall, the Bolivian case highlights two main points. First, lack of ideological differentiation exposes parties to the challenges of political decentralization, even when economic performance is satisfactory. Bolivia’s economic stability from the onset of decentralization through the late 1990s shielded the traditional parties from the dramatic deterioration observed in Venezuela, but once ideological differentiation evaporated from the Bolivian system, the costs imposed by decentralization could not be fully resisted, and the parties began to decline. Second, Bolivia’s traditional parties were accustomed to centralized modes of competition and were poorly equipped to manage the strains that decentralization imposed, while parties that emerged in already-decentralized contexts, like MAS, leveraged further decentralization to their advantage. The Chilean experience further emphasizes how the context in which decentralization occurs shapes its consequences. In the early 1990s, Chile implemented a series of institutional reforms, including establishing direct mayoral elections in place of the indirect selection process used since the democratic transition, imbuing municipal governments with greater significance (Eaton 2004, 227, 235; Marcel 1994). These reforms created organizational challenges and heightened clientelist demand (Eaton 2004, 235; Luna 2008) but occurred in a context of economic prosperity and a moderately programmatic party system (Kitschelt et al. 2010). During the first two legislative elections following political decentralization, economic growth in Chile was over 6.5 percent (World Bank 2012), and the party system was among the more programmatically structured in the region (Kitschelt et al. 2010). These circumstances helped parties navigate challenges posed by decentralization, as the strong economy offered adequate resources while policy differentiation facilitated programmatic linkage, at least among some sectors (Luna 2014). As a result, Chile’s major parties did not decay following decentralization. Rather, their legislative seat share increased eight points in the 1993 elections and declined by less than two points in 1997, and recent indications of deterioration in the Chilean party system (Morgan and Meléndez 2016) have occurred well after the threat from decentralization had passed. Quantitative and qualitative analyses indicate that political decentralization challenges established parties and that encountering these challenges amid economic crisis and without meaningful programmatic appeals contributes to major party decay. Of course, multiple factors influence party decay, and this article does not propose to offer an exhaustive account of all variables that weaken established parties. Rather, the focus here has been on assessing how context conditions the impact of political decentralization across party systems. The evidence presented on that point indicates that parties well adapted to subnational contests often make effective use of decentralized structures to build support and protect their organizations, but for parties unaccustomed to decentralized competition, creating subnational elections inflicts significant organizational and resource burdens. When parties grapple with these challenges armed with sufficient resources or effective programmatic linkage, as occurred in Chile, adaptation is achievable, but when political decentralization is coupled with resource shortages or limited programmatic differentiation, as in Venezuela and Bolivia, major parties fare poorly. This evidence complements previous research emphasizing how economic crisis and lack of programmatic differentiation contribute directly to party decay. While the analysis here has focused on ways in which these contextual features shape how decentralization affects established parties across the system, future research might also consider how party-level factors, such as the structure of party organizations or nomination procedures, shape individual parties’ performance after decentralizing reforms. This approach would enable exploration of how different parties operating in the same system deal more or less effectively with decentralization. Previous scholarship on party organizational adaptation (e.g., Wills-Otero 2014) as well as evidence presented here from Bolivia, where the parties that formed before and after decentralization experienced contrasting trajectories under consecutive rounds of reform, point to the value of this line of inquiry. Reformers and early scholarship on decentralization emphasized possible gains in participation, efficiency, and accountability. Later, more critical assessments pointed to decentralization’s role in undermining representation and increasing opportunities for corruption. Although benefits from decentralization have been realized in some contexts, the costs for established parties and for the stable competitive structure they provide have been significant in others. The analysis helps illuminate why decentralization’s impact follows these paths, detailing how the economic and organizational context of reforms shaped their consequences for parties. Additionally, some decentralization advocates have argued that devolving power away from the central government would limit clientelism and promote more programmatic representation and accountability, at least at the subnational level. The analysis here supports the assessment that political decentralization challenges centralized clientelist distribution. However, weakened hierarchical clientelist networks have typically not been replaced with programmatic linkages. Instead, subnational clientelism has proliferated, undermining established parties without reshaping the dominant mode of linkage. The evidence suggests that reformers seeking to strengthen accountability and democracy via political decentralization may have sacrificed existing institutions of representation in pursuit of these goals. Together, these findings indicate that decentralization is not a panacea and emphasize how context conditions the effects of reform. In particular, reformers would be wise to avoid decentralization amid poor economic conditions or limited ideological differentiation. This insight concerning the timing of reform should be considered not only by domestic policy makers but also by actors in the international community who may exercise considerable influence over these reform choices. Of course, such foresight is not always possible. Therefore, efforts to strengthen parties, promote organizational flexibility and foster meaningful programmatic alternatives in order to shore up parties’ adaptive capacity before any reform initiatives arise are an important complementary strategy for promoting the stability and quality of representation in contexts where resorting to institutional reform has become routine. This article joins an important body of scholarship that has emphasized ways in which political reforms of all sorts produce unintended consequences. Here we see that when the logic of competition imposed by reforms inherently contradicts extant patterns of successful party organization incentivized by the existing institutional framework, the adaptive effort required to remain competitive is immense. These results suggest that electoral reforms of any kind should be undertaken with an eye toward identifying potential unintended consequences, particularly when the reform would require a significant departure from the status quo. Thus, whether the move is toward decentralization, recentralization, or changing other components of the competitive environment, such as legislative or presidential election rules, reforms that make existing organizational strategies inefficient or ineffective create substantial challenges for existing parties and make them vulnerable to new competitors. 1Although some envisioned decentralization as eliminating clientelism, thereby undermining parties (Fox 1994). 2The goal is not to propose a comprehensive list of factors that undermine parties, but to assess how decentralization shapes this process. 3I am interested here in understanding how decentralization encourages new competitors and poses a challenge to all parties with a stake in the status quo. Reflecting this logic, the concept of systemic party decay refers to joint decline in support for existing parties. I use the terms “systemic party decay,” “major party decay,” and “party decay” interchangeably to refer to this idea. 4The theory and analysis focus on ways in which decentralization creates challenges for all parties within the system and opens the door to challengers. Thus, I emphasize system-level features that shape decentralization’s effects, as opposed to individual party characteristics that may make particular organizations more or less resilient to decentralization’s challenges. 5Interviews 39, 41, 48, 51, and 53. See the supplemental appendix for interviewee information. 6Gutiérrez and Zovatto (2011) detail the array of party funding frameworks in the region. 7Personalism may provide some linkage, but such appeals offer little by way of substance or tangible benefit. Electoral vehicles based only on charisma come and go quickly regardless of institutional context, making it difficult to formulate hypotheses concerning how such parties might shape the impact of decentralization in any consistent way. For parties to form organizations that might be affected systematically by reforms such as decentralization, personalism must be employed in conjunction with something more concrete, like clientelism or programmatic appeals (Morgan 2011). Thus, focusing on programmatic and clientelist linkage captures the systematic ways in which party strategies might condition the effects of decentralization (Barr 2009; Kitschelt and Wilkinson 2007). 8Decentralization data for Paraguay were not available. 9Legislatures are considered democratic if elected during a year when the country’s Polity2 score was at least six. 10I use seats rather than votes because winning representation better reflects a party’s influence. In bicameral legislatures, I use the lower chamber. 11Major parties are those with the largest seat shares in the previous term. To specify how many qualify as major, I calculate the effective number of parliamentary parties (ENPP), rounding to the nearest whole number. For each term (t), I calculate ENPP in the previous term to identify major parties at (t-1); then I estimate change in support for these parties between t-1 and t. Given this approach, the set of parties identified as major varies temporally. Some countries like Chile feature only subtle variation in the set of major parties, while others display stretches of stability punctuated by significant changes (e.g., Venezuela), and others vary from one election to the next (e.g., Ecuador). These patterns and the specific parties identified align with conventional understandings of party systems’ composition and volatility across the region. Seat share data are from a variety of sources including Payne et al. (2007), national election returns, and Georgetown’s Political Database of the Americas. 12I filled in missing data for Argentina, Brazil, and Uruguay and corrected minor errors for Nicaragua and Venezuela after consulting country experts and primary and secondary sources. 13The smooth-compact decay function is exp(k–k/(1–(t/L)^2); where k = 0.5 and L = 10. L is a description of the decay rate; k is a shape parameter. 14Additional analysis in Supplemental Table 4 and Supplemental Figures 1 and 2 replaces the transformed version of the decentralization measure with a series of lags. The evidence there coincides with the findings presented here using the decay function. See supplemental material for details. Alternate decentralization measures, including applying different decay functions and cumulating changes in decentralization without decay, produce similar substantive results. 15World Bank data. Supplemental Table 3 includes additional controls for inflation and unemployment, which are either entirely insignificant (unemployment) or occasionally significant but with very small substantive effects (inflation). Excluding them does not alter the substantive findings. 16Ideological differentiation for country year ij is √ΣSij(LRij–LRj)2 where Sij is the share of the legislature controlled by party I, LRij is the estimated left-right position of party i and LRj is the average ideology for the entire legislature (weighted by each party’s size). 17The measures produce similar results. 18Ideological differentiation varies significantly across the region, with countries like the Dominican Republic and Panama exhibiting low polarization while others like Chile and Nicaragua average higher levels. The measure also exhibits temporal variation within countries. Some show significant shifts while others experience more limited change. Uncentered range: 0.23–2.75. 19Party age and proportionality from DPI. 20Calculating panel-corrected standard errors is not possible because the time series do not overlap across panels and some countries have less than three time points. 21Supplemental Table 5 and Figure 3 report full results of this analysis. Despite questionable data quality and poor coverage, a general pattern and one statistically significant interaction suggest fiscal decentralization may heighten the costs of political decentralization. 22For details, see the supplemental appendix. 23Supplemental analysis controls for inflation and unemployment but finds little evidence that they influence systemic party support. Excluding them does not alter the substantive findings. 24Field research was conducted in March–December 2003, May–August 2006, and May 2012. Respondents were selected based on their positions as party leaders and on reputational data collected by the author. See the supplemental appendix for details. 26Interviews 44, 48, 49, 51, and 53. 28Interviews 48 and 53; El Nacional, July 11, 1994, D-4. 29Interviews 42, 44, 45, and 51. 30Interview 84; El Nacional, July 11, 1994, D-4; El Nacional, December 17, 1993, D-4; El Nacional, September 2, 1995, D-2. 31This process of new decentralization stands in contrast to already-decentralized systems that facilitated clientelist delivery via party organizations well adapted to this reality, as in Argentina. 32Interviews 39, 44, and 51. 33See supplemental material for full results. 34The Bolivian constitution required Congress to select the president because no candidate received 50 percent of the vote. Thus, Paz Zamora, the close third-place finisher, became president with the backing of MIR and ADN. 35Growth remained steady through the 1997 elections, the first national contests following expansion of municipalization through LPP, and the traditional parties—ADN, MNR, and MIR—together with movements that entered the system following the first round of decentralization, UCS and CONDEPA, nearly replicated their 1993 seat shares in 1997. But by the early 2000s, resource shortages from further fiscal decentralization and a declining economy combined with the extension of municipalization under the LPP to strain the parties, contributing to decay in the 2002 elections. However, both these election cycles lie outside the scope of the ten-year window following initial implementation of subnational elections that I employ in the quantitative analysis, so I do not discuss them in detail here. I am grateful to Curtis Bell, Joon Han, Jonathan Hartlyn, Nate Kelly, Steve Levitsky, Scott Mainwaring, Indira Palacios, Ken Roberts, Iñaki Sagarzazu, and the anonymous reviewers for their helpful comments on the manuscript, and to Agustina Giraudy, Imke Harbers, Juan Pablo Luna, and Juan Pablo Micozzi for their assistance with decentralization data and coding. Funding for this research was provided by the Fulbright-Hays program and the Chancellor’s Professional Development Awards at the University of Tennessee. The author has no competing interests to declare. This research was conducted under approval of the University of Tennessee, Knoxville, Institutional Review Board, UTK-IRB-07011, and complies with requirements concerning research on human subjects. Beck, Thorsten, George Clarke, Alberto Groff, Philip Keefer, and Patrick Walsh. 2001. “New Tools in Comparative Political Economy.” World Bank Economic Review 15(1): 165–176. 2010 update. Bland, Gary. 2004. “Enclaves and Elections: The Decision to Decentralize in Chile.” In Decentralization and Democracy in Latin America, edited by A. P. Montero and D. J. Samuels, 94–121. Notre Dame: University of Notre Dame Press. Conaghan, Catherine M., and James M. Malloy. 1994. Unsettling Statecraft: Democracy and Neoliberalism in the Central Andes. Pittsburgh: University of Pittsburgh Press. Corrales, Javier. 2002. Presidents without Parties: The Politics of Economic Reform in Venezuela and Argentina in the 1990s. University Park: Pennsylvania State University Press. Dargent, Eduardo, and Paula Muñoz. 2011. “Democracy against Parties? Party System Deinstitutionalization in Colombia.” Journal of Politics in Latin America 3(2): 43–71. de la Cruz, Rafael. 2004. “Decentralization: Key to Understanding a Changing Nation.” In The Unraveling of Representative Democracy in Venezuela, edited by J. L. McCoy and D. J. Myers, 181–201. Baltimore: Johns Hopkins University Press. Fernández, Yajaira. 2003. Gasto público social en Venezuela. Working Paper. Caracas: PNUD, Cooperación Técnica Alemana, Ministerio de Salud y Desarrollo Social. Goldfrank, Benjamin. 2011. Participation, Decentralization, and the Left: Deepening Local Democracy in Latin America. University Park: Pennsylvania State University Press. Grindle, Merilee S. 2000. Audacious Reforms: Institutional Invention and Democracy in Latin America. Baltimore: Johns Hopkins University Press. Gutiérrez, Pablo, and Daniel Zovatto, eds. 2011. Financiamiento de los partidos políticos en América Latina. Mexico: IDEA, OAS, UNAM. Gutiérrez Sanín, Francisco. 2007. Lo que el viento se llevó? Los partidos políticos y la democracia en Colombia 1958–2002. Bogotá: Norma. Kornblith, Miriam. 1998. Venezuela en los 90: Las crisis de la democracia. Caracas: IESA. Lalander, Rickard O. 2004. Suicide of the Elephants? Venezuelan Decentralization between Partyarchy and Chavismo. Helsinki: Renvall Institute for Area and Cultural Studies. Luna, Juan Pablo. 2008. “A Lost Battle? Building Programmatic Party-Voter Linkages in Contemporary Latin America.” In New Voices in the Study of Democracy in Latin America, edited by G. O’Donnell, J. S. Tulchin, and A. Varas, 153–218. Washington, DC: Woodrow Wilson International Center for Scholars. Mainwaring, Scott P., and Timothy Scully. 1995. “Parties and Democracy in Latin America—Different Patterns, Common Challenges.” In Building Democratic Institutions: Party Systems in Latin America, edited by Scott Mainwaring and Timothy R. Scully, 459–474. Stanford, CA: Stanford University Press. Marcel, Mario. 1994. “Decentralization and Development: The Chilean Experience.” In En Route to Modern Growth, edited by G. Ranis, 79–121. Baltimore: Johns Hopkins University Press. Morgan, Jana. 2011. Bankrupt Representation and Party System Collapse. University Park: Pennsylvania State University Press. Morgan, Jana, and Carlos Meléndez. 2016. “Parties under Stress: A Linkage Decay Framework Applied to the Chilean Party System” Journal of Politics in Latin America 8(3): 25–59. Nickson, R. Andrew. 2011. Where Is Local Government Going in Latin America? Working Paper No. 6. Swedish International Centre for Local Democracy. Payne, J. Mark, et al. 2007. Democracies in Development: Politics and Reform in Latin America. Washington, DC: Inter-American Development Bank, International Institute for Democracy and Electoral Assistance, and the David Rockefeller Center for Latin American Studies, Harvard University. Penfold-Becerra, Michael. 1999. “Institutional Electoral Incentives and Decentralization Outcomes: Comparing Colombia and Venezuela.” PhD diss., Columbia University. Vergara, Alberto. 2011. “United by Discord, Divided by Consensus: National and Sub-national Articulation in Bolivia and Peru, 2000–2010.” Journal of Politics in Latin America 3(3): 65–93. World Bank. 2012. Government Finance Statistics. Data file.